The mandibular nerve is a terminal branch of the trigeminal nerve (along with the maxillary and ophthalmic nerves). It has a sensory role in the head, and is associated with parasympathetic fibres of other cranial nerves. However unlike the other branches of the trigeminal nerve, the mandibular nerve also has a motor function. 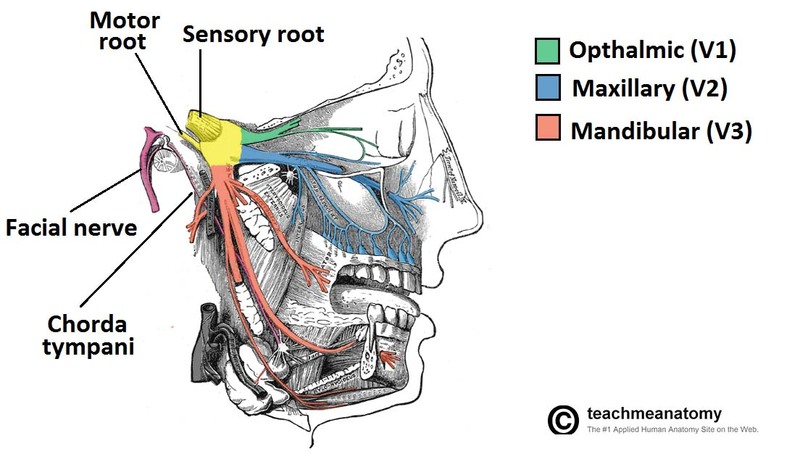 In this article, we shall look at the anatomy of the mandibular nerve – its anatomical course, branches, sensory, motor and autonomic functions. The mandibular nerve contains both sensory and motor axons, arising from three sensory nuclei (mesencephalic, principal sensory and spinal nuclei of trigeminal nerve) and one motor nucleus (motor nucleus of the trigeminal nerve) respectively. The motor root runs along the floor or the trigeminal cave, beneath the ganglion, joining the sensory root before leaving the cranium through the foramen ovale. Once the mandibular branch has emerged from the cranium, it courses through the infratemporal fossa, branching into four tributaries which are described below. Superior root – comprises sensory fibers. Inferior root – carries secretory-motor parasympathetic fibers, originating from CN IX, to the parotid gland. The buccal branch of the mandibular nerve contains sensory fibres. As it emerges from the mandibular nerve, it passes between the two heads of the lateral pterygoid muscle before heading to its target sites. The nerve provides general sensory innervation to the buccal membranes of the mouth (i.e. the cheek). It also branches to supply the second and third molar teeth, which is important when performing dental work on those structures. The inferior alveolar nerve carries both sensory and motor axons to and from the respective trigeminal nuclei. After branching from its parent nerve it gives rise to the mylohyoid nerve, a motor nerve to the mylohyoid and anterior digastric muscles. The remaining sensory axons enter the mandibular canal, a narrow tunnel running through the mandible bone. Within this canal the nerve provides branches to the mandibular teeth. The nerve emerges through the mental foramen as the mental nerve. This provides sensory innervation to the lower lip and chin. Fig 2 – Anatomical course of the inferior alveolar and lingual nerves. Note the close proximity of the two nerves. The portion of the inferior alveolar nerve that runs through the mandibular canal has been removed. This branch of the trigeminal nerve carries general sensory axons. 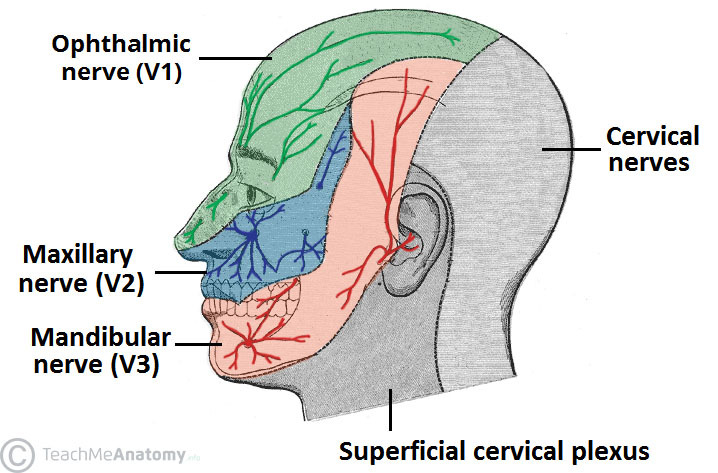 It also acts as a conduit for special sensory and autonomic fibers belonging to the chorda tympani, a branch of the facial nerve (CN VII). General sensory fibers innervate the anterior two-thirds of the tongue, as well as the mucus membrane lining its undersides. The special sensory fibers carry on with the lingual nerve to provide taste to the anterior two-thirds of the tongue. 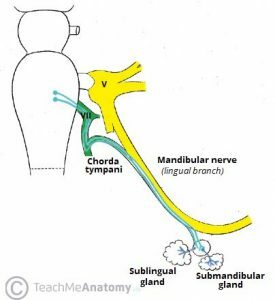 The autonomic fibers branch to synapse in the submandibular ganglion, eventually innervating the submandibular and sublingual glands. Fig 3 – The submandibular ganglion. These functions are distributed between the four branches of the nerve, as described above. Note that special sensation to the anterior two thirds of the tongue is provided by the facial nerve. 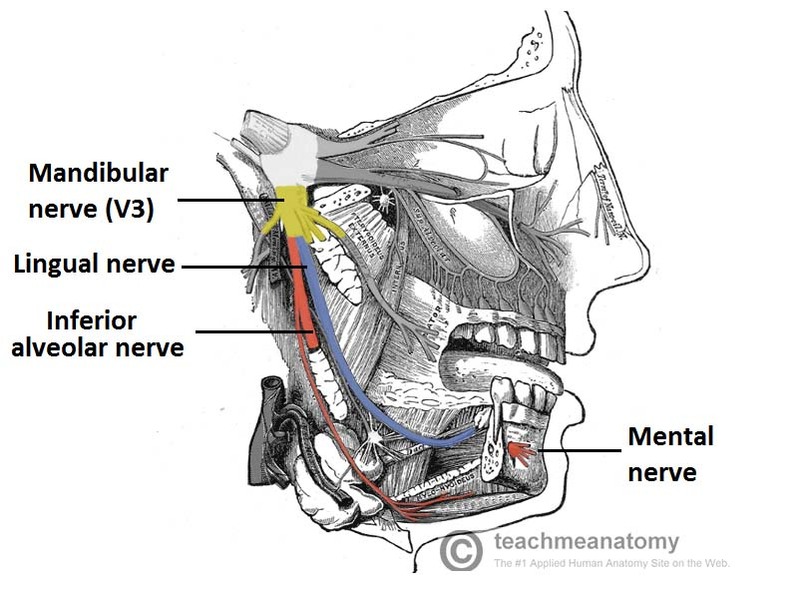 The mandibular nerve is the only branch of CN V to conduct motor axons to the muscles of the head and neck. Tensor veli palatini: helps elevate the soft palate to prevent regurgitation of food and liquid into the nasopharynx. The trigeminal nerve does not have an autonomic nucleus and, as such, does not give rise to any autonomic axons directly. 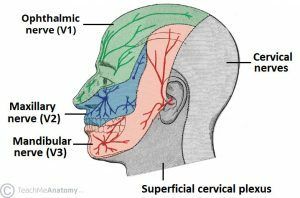 However, all three branches of CN V take on autonomic fibers of other cranial nerves to provide a passage to their respective targets. The mandibular nerve is associated with parasympathetic secretory-motor fibers from two other cranial nerves. The chorda tympani nerve branches from the facial nerve in the region of the middle ear. It carries pre-synaptic parasympathetic fibers which join the lingual branch of the mandibular nerve, before branching to synapse in the submandibular ganglion. These fibers go on and innervate the submandibular and sublingual salivary glands. Autonomic innervation of the parotid gland originates from CN IX, however the auriculotemporal nerve transmits the post-synaptic axons from the otic ganglion to the gland. They pass through the inferior of the two founding roots of the branch. The use of local anesthetic in the region of the mandibular nerve, and its tributaries, is a common procedure used in dental surgery. The principle behind the block is to remove general sensation from the ipsilateral mandibular row of teeth. In doing so however, anesthesia can also spread over the buccal membranes, chin and jaw. The technique involves injecting the blocking agent into the region of the mandibular nerve from inside the mouth, guided by the second molar tooth. A more specific option involves an inferior alveolar nerve block. This allows anesthesia of the inferior row of teeth while sparing the sensory distribution of the rest of the nerve. Here, the blocking agent is injected from inside mouth further along the mandibular nerve. The more specific option is often used, however where it does not provide adequate anesthesia, for instance due to an accessory nerve, a mandibular nerve block is used. Which cranial foramina transmits the mandibular nerve from the cranial cavity to the infratemporal fossa? Which branch of the mandibular nerve passes through the mandibular canal to eventually become the mental nerve? Which of the following options best describes the role of the mandibular division in the head and neck?